The new SA06 is in fact an updated SA05 still based on the same Arrows A23 chassis. However, the aerodynamics in the rear have dramatically changed and built with similarity to that at the Honda works team. The widely known twin keel design that was introduced by Mike Coughlan at Arrows therefore remains unchanged. Obviously, as Honda's B-team, Super Aguri have with their new car still the same Honda powerplant at their disposition. 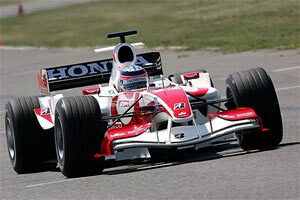 Although that engine was very good at the beginning of the season, Honda have suffered to develop it while reliability has also become a problem during the first half of 2006. Surprisingly though, Super Aguri have developed an aluminium cased gearbox instead of Honda's carbon fibre box which was also used in the Super Aguri SA05. Chassis construction: Moulded carbon fibre and honeycomb composite construction incorporating front and side composite impact structures. Integral roll protection structures. Fully enclosed fuel cell. Bodywork construction: Composite one piece side pod and engine cover, separate carbon floor section, structural composite nose box and composite wings. Front suspension: Wishbones, pushrod operated torsion bars and dampers. Mechanical anti-roll bar. Rear suspension: Wishbones, pushrod operated coil springs and dampers. Mechanical anti-roll bar.